Cape Town - Bafana Bafana head coach Stuart Baxter has insisted that there are no dead rubber games in the national team set up and would select the best starting XI for their final 2018 Soccer World Cup match against Senegal at the Stade Leopold Sedar Senghor in the capital Dakar. 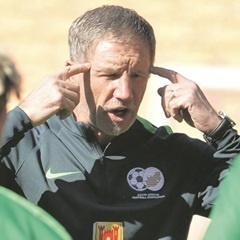 "It is important to finish our campaign with a flourish," said Baxter as quoted by the official SAFA website. "We are playing one of the biggest teams on the continent and this is a great stage for players to show their mettle." Looking back at Friday’s 2-0 defeat, Baxter said there were positives to take away from that match as much as the result was not "what we wanted". "Friday’s match showed we can match the best on the continent," Baxter said. "It also showed we can be our own worst enemies at times. "We had Senegal against the ropes for most of the first half but failed to take our chances. "This has been our constant problem whether in the domestic league or national level - failure to convert numerous scoring chances; and in most cases you will be made to pay for it." The national team coach said there were a number of youngsters coming through the ranks and he was also encouraged by how the country is developing their own playing identity and culture. "But such progression is at times hampered by failure to get results on the field of play on consistent basis; because winning games is what qualifies you for tournaments,” he said, adding it was important to bring through as many youngsters as possible. "This was not the time to despair but to continue working hard and persevere. There is an urgent need though to quicken this process." Kick off is at 21:30 (SA time) on Tuesday, November 14.